Okay, I know it's only October BUT you can never be too early when it comes to Christmas shopping! I've decided to start buying things for loved ones already this year - mainly so I actually have some money left when it come to December and new year! 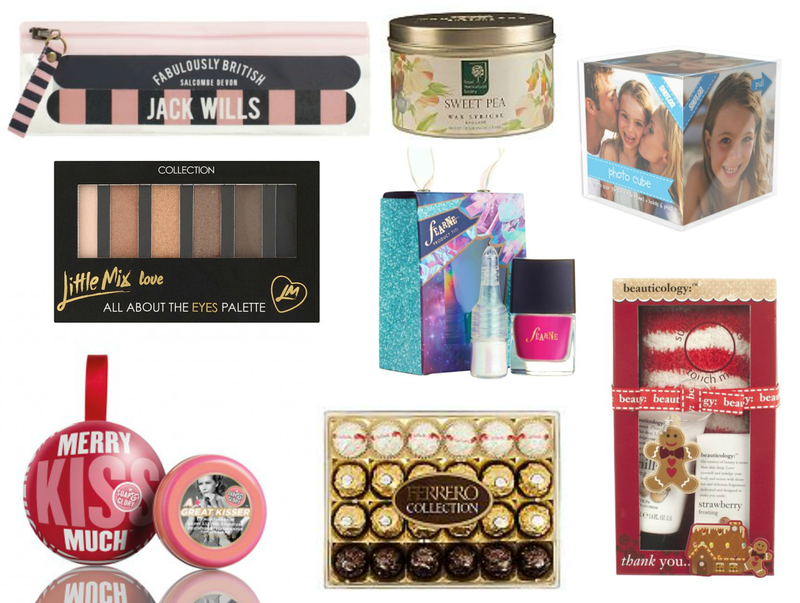 Boots is a great place to get your Christmas gifts and I've seen so many of you chatting away on twitter about getting the gift guide that's been recently released! I always love hunting through their Christmas 3 for 2 mix and match pressies and probably buy more for myself than anyone else - opps! So I thought what better on the lead up to the most wonderful time of the year than a few gift guides to help you on your quests to find the perfect gift for those special people in your life (or those ones you got stuck with in your work's secret santa!). Sweet pea is one of my favourite scents when it comes to products and candles and this little stokcing filler is great for anyone! Who doesn't love a lovely smelling home? Whether you give this present as it comes or fill the photos in yourself this is cutest little cube for anyones dresser or work space! So much better as a frame as you can have a total mix of photos all on one product! Baylis & Harding had a similar set out last year which I was really sad about missing out on! By the time I went to order it for myself it was out of stock and I couldn't find it anywhere! Fluffy socks AND cute products for only £5 - yup I'm sold! Jack Wills is a brand that's been in my life for a good few years, living on an island which is surrounded by boats and the 'yauchty' brand is pretty popular here! These nail files are super cute and handy, good for any manicure lover. A bauble AND a lip balm in one! I love Soap and Glory stuff and their Christmas lines never seem to disappoint! I've used S&G lip balms before and they are lovely, what better present for a beauty babe! Yes I now this isn't in the Christmas collection but this is such a lovely little gift for a tiny price tag! If you've got a secret santa to do this lovely neutrals palette is a great idea! Collection make-up is always fantastic quality and if they are a Little Mix fan then it's a double whammy! Everyone's a fan of Fearne! Her collection for Boots each Christmas is always a best seller and this year I'm sure will be no exception! Again, the perfect stocking filler for girls ad women alike! Keep your eyes peeled for my next top picks - £10 and under, coming soon! What are you hoping to get for Christmas? Like this post? Follow A Yellow Brick Blog on  Bloglovin! Anything gingerbread scented and I'm sold! And for a fiver aswell. These will be great for stocking fillers! The Little Mix stuff is going down a treat, huh! Wow, the colors on the All About The Eyes palette look amazing for the price! Love! The Perfect Pamper Night In For Under £6!! !